Artist John Trumbull's Declaration of Independence. It can be seen in the rotunda of the U.S. Capitol. Thomas Jefferson, president, statesman and principal author of the Declaration of Independence. The line at the top of this post has the words that are probably most remembered. But today, let's focus on a few words and phrases that have not have gotten as much attention. They are important in understanding the messages that were sent by Thomas Jefferson and those who helped him write the declaration. For guidance, we turned to Stephen Lucas, the Evjue-Bascom professor in the humanities at the University of Wisconsin, Madison. He's the author of "The Stylistic Artistry of the Declaration of Independence," a paper that's one of the first things you see on the National Archives' Web pages about the declaration. -- "Necessary," "one people" and "another"
"Necessary," according to Lucas, "is the most important word" in that section. It makes the case that colonists had no choice. They had to break away. It's also a word that rebutted a British view. "It was very important to the British that the colonists be labeled 'rebels,' " Lucas said this week when we spoke to him by telephone. "The colonists wanted to ensure that they not be labeled as rebels." If revolution was "necessary," then they weren't rebels. That position was supported by the idea that the colonists were "one people" who needed to separate themselves from "another" (the British). They weren't subjects, or second-class citizens in any way. They were equals. The message wasn't just for American or British audiences. The declaration was telling the world that this wasn't a civil war between rebels and rulers. Potential allies such as the French might have wanted to avoid being part of that type of conflict. -- "Facts ... submitted to a candid world"
That last sentence, Lucas wrote in his paper, "is so innocuous one can easily overlook its artistry and importance. The opening phrase — 'To prove this' — indicates the 'facts' to follow will indeed prove that George III is a tyrant. But prove to whom? To a 'candid world' — that is, to readers who are free from bias or malice, who are fair, impartial, and just." "Submitted" is also an interesting word choice. The "facts" were not being "suggested" or "alleged." They were being presented as what Jefferson and the others saw them — the truth. -- A chiasmus: "Enemies in War, in Peace Friends"
But, the declaration adds, Americans will treat the British people "as we hold the rest of mankind, Enemies in War, in Peace Friends." Today, a speechwriter would very likely had ended that section with "enemies in war, friends in peace." But the declaration employs a chiasmus. That's a rhetorical device in which the second of two parallel phrases is inverted. In this case, "Friends" was placed at the end of the phrase. The purpose, Lucas said, is to "slow the text." Especially when the line is read aloud, as the declaration would have been to crowds at the time, the chiasmus forces listeners to concentrate on the message: That the Americans were reasonable people being forced to take up arms, but that they would surely be friends with the British again some day. 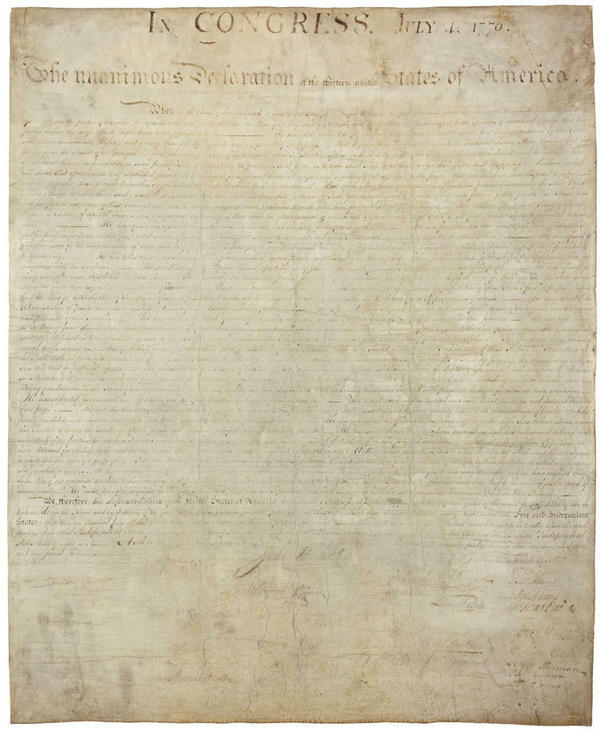 Obviously, there's much more that could be said about the language of the declaration. In his paper, Lucas digs deep and notes that the declaration "gradually becomes a kind of drama, with its tensions expressed more and more in personal terms." Today is a good day to study it again, to listen to Morning Edition's annual reading and to see if you agree with Lucas' conclusions. We hope you enjoy Independence Day. We've got another politics story, but this one goes way back, all the way back to the founding of this country. UNIDENTIFIED WOMAN #1: (Reading) That all men are created equal. WESTERVELT: Those voices were recorded last year on the National Mall. 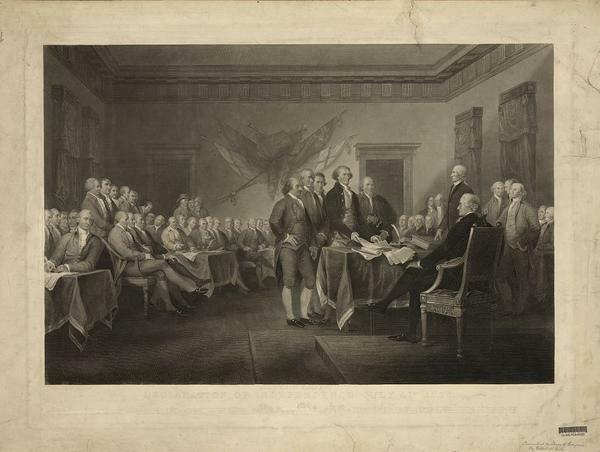 This year, to celebrate the Fourth of July, we're examining the text of the Declaration of Independence, but not the parts you've heard over and over again. The smallest details of phrasing in that declaration were crucial. Many words carried hidden meanings, small proclamations meant to legitimize aspirations for independence and little barbs for the British. It's part of Mark Memmott's job to pay attention to how we use words. He's NPR's supervising senior editor for standards and practices. Welcome, Mark. MARK MEMMOTT, BYLINE: Glad to be here. WESTERVELT: OK, point us to a word in the Declaration of Independence that we might not have paid that much attention to. MEMMOTT: I should say right here that I learned a lot about this this week from Professor Stephen Lucas, University of Wisconsin-Madison. The word is necessary. MEMMOTT: (Reading) It becomes necessary for one people to dissolve the political bands which have connected them with another. The signers and the Continental Congress were telling the world that revolution was inevitable, or unavoidable. WESTERVELT: Anything else jump out at you, Mark? UNIDENTIFIED MAN #1: (Reading) ...To prove this, let facts be submitted to a candid world. MEMMOTT: Let facts be submitted to a candid world. They were basically saying that these aren't allegations or accusations. These are facts. And a candid world, one without bias, is going to know that these are true. WESTERVELT: And I understand there are some literary devices embedded in the document as well. Tell us about that. MEMMOTT: Yeah, Eric, I learned a new word this week - chiasmus. WESTERVELT: I don't know it. UNIDENTIFIED MAN #2: (Reading) Enemies in war, in peace friends. MEMMOTT: Enemies in war, in peace friends. Now today, a speechwriter would probably write enemies in war, friends in peace. But that chiasmus, enemies in war, in peace friends, slows the text, especially when read aloud, which the declaration was as it was taken around the country. It puts an emphasis on that idea that America and Britain would be allies again one day. WESTERVELT: Mark Memmott is NPR's supervising senior editor for standards and practices. You can write to him at wordmatters@npr.org. Mark, thanks a lot and happy Fourth of July. MEMMOTT: You're welcome, glad to be here. Transcript provided by NPR, Copyright NPR.